A variety mushrooms gives nuance to this hearty vegetarian soup. Any assortment of fresh mushrooms will work and you can change those flavorful notes by switching up the combination each time you make it. 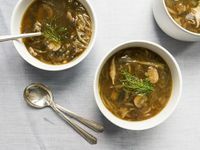 A variety of mushrooms gives nuance to this hearty vegetarian fennel soup. Any assortment of fresh mushrooms will work and you can change those flavorful notes by switching up the combination each time you make it. Add nuance to this mushroom soup by changing up the mushroom combination each time you make it. In a large saucepan, heat 4 tablespoons olive oil over medium-high. Add the onions and fennel and cook, stirring, until soft and caramelized, about 1 hour. Add the garlic and cook, stirring, until fragrant, 2 minutes. Pour in the stock and bring to a simmer over medium heat. Meanwhile, in a 12-inch skillet, heat the remaining 1 tablespoon olive oil over medium-high. Add the mushrooms and cook, stirring, until golden, about 5 minutes. Add the wine and cook until slightly reduced, about 5 minutes. Scrape the mushrooms and wine into the soup and cook, stirring, to marry flavors, about 5 minutes. Season the soup with salt and pepper, ladle into bowls, and garnish with the reserved fennel fronds.